I must first admit that I have a soft spot for zombie books, and apocalypse books in general, which is what originally made me buy this book online. 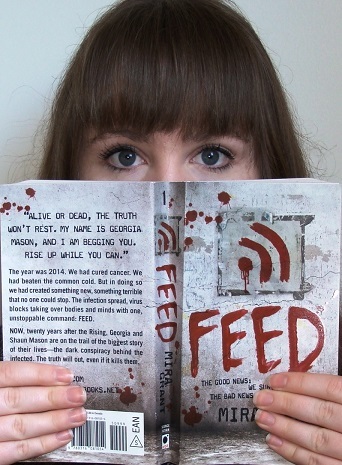 Mira Grant‘s book ‘Feed‘ did not disappoint, it had a sizeable helping of gadgets and gore which is expected of this kind of book, but what made me love it was all the unexpected angles on inquiry into society. The first surprising thing was the setting, or rather the time of the setting, 20 years after the ‘Rising’ is not you usual starting point for a zombie novel. In the genre the good (who could go past ‘World War Z‘?) and the bad (I want 5 hours of my life back- ‘Married with Zombies‘) seem to have all, or at least most, of their action taking place during the main ‘rising’. My favourite part about reading this book was thinking of it as an allegory for the US fear-mongering in response to the threat of terrorism. Yes, my university degree impacts on how I read zombie novels, and I am well aware that Grant may not have had any intention of it being read like that, but it doesn’t make it any less interesting as a political commentary in the face of a threat. Since I have also been reading extensively on propaganda, communication techniques, narrative theories and all sorts of other wonderful things (like disconnection from traditional media sources and what that means for politics), Grant’s version of future news media as blogging was also fascinating. I especially enjoyed some of the commentary on ‘ethics’ and ‘truth’ because if you ignore the zombies this book has a lot of insightful observations about the media culture in the US (and the rest of the world). Another plus for this book was decent non-Mary-Sue female protagonist! I don’t want to give anything away, so I shall not say any more. But I did find it really refreshing to read a novel filled with a number of interesting, multi-dimensional female characters, rather than a token cookie-cutter female victim or hero. My final good point about this book is fearless plot progression. I recently read the first book of the Codex Alera Series (which I will review when I read the next few) but my main bugbear with Jim Butcher is his addiction to ALMOST killing all/most of his main characters in every single book, only to have them revive in time for the rest of the series (Harry Dresden *cough*). It drives me mad. The only downside to this book was the slow plot development in the first third of the book, I feel like there was a lot was superfluous information which, while helping to build a picture of the ‘world’, but didn’t really contribute anything to the main plot.